Round Rock Texas, and Round Rock Hotels. Yes, there really was a Round Rock, and you can even see it. Judge for yourself if it even looks remotely round. Although its population and proximity to Austin make it seem out of place, we're including it for it's abundant limestone buildings. It's also a pleasant place to play hooky from Austin. Remember when Austin was a hooky player's destination? The Chamber of Commerce has some old photographs and memorabilia of the town displayed in a comfortable setting. Look them over before entering the Chamber proper. Be prepared for a very businesslike atmosphere toward the back. This is not a small town, remember. Their colorful brochure is representative of the tightrope they seem to be walking between the past and the future. An excellent, easy to read map shows all points of interest and then some. 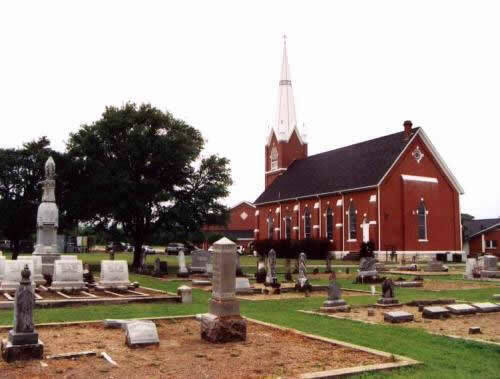 The Round Rock is mentioned as well as the historical buildings, downtown, and the cemetery where Sam Bass is buried. I once chided Round Rock about Sam Bass Road. I had written that Gonzales would never have named a street after John Wesley Hardin, even though he once practiced law there. Imagine my surprise when I picked up The Story of Sam Bass, in the Chamber of Commerce and read an anonymous biography that was harder on him than I had been. We both used the word "inept" and the phrase "blown out of proportion". His name isn't even remotely euphonic, and is missing the all-important third name like John Wesley Hardin or Billy the Kid. So why did he become a legend? Permanent settlement began in this area in the late 1830s. By 1848, former Austin Mayor Jacob Harrell moved here, selling town lots near the Stagecoach Road crossing at Brushy Creek. A post office named “Brushy Creek” opened in 1851 in Thomas Oatts’ store. Three years later, the name changed to “Round Rock” for a distinctive limestone formation marking a natural ford for wagons. With immigration from several states and Sweden, the population doubled during the 1850s, bringing new stores, churches, fraternal lodges and grain mills. The first institution of higher learning, Round Rock Academy, began in 1862. After the Civil War, the former trail and stage road became a prominent cattle drive route. In 1876, the International-Great Northern Railroad developed a new townsite east of the existing Round Rock. A commercial district sprang up along Georgetown Avenue (Main Street) with construction of many limestone buildings. “New Town” quickly eclipsed the established settlement, whose postal name changed again to “Old Round Rock.” For months, the new site was the railroad terminus, bringing lumber and flour mills, cotton gins, blacksmith and wagon shops, banks, hotels, restaurants, stores and schools. Round Rock challenged the state capital for economic control of central Texas, boasting six hotels to Austin’s five and serving as the retail hub for several counties to the west. 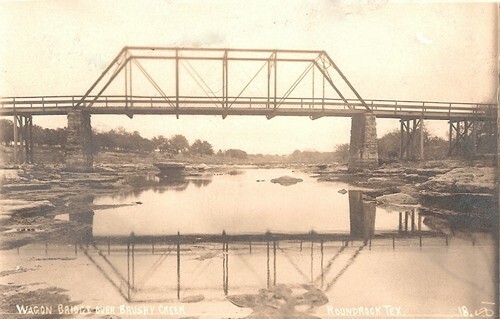 The railroad also made Round Rock a more cosmopolitan place, bringing new residents from all over the U.S. And all around the world. Well-positioned for growth by its location on major transportation routes, Round Rock became one of the nation’s fastest-growing cities by the late 20th century. Two dozen commercial buildings in Round Rock’s historic downtown were listed in the National Register of Historic Places in 1983. To this day, the Hairy Man's ghost roams along the same shady road upon which he had died such a grisly death, doomed forever to seek return of the life that was so violently ripped from him. Kindly Texans have since tried to make it up to him by celebrating an annual Hairy Man Festival each October, Halloween month. There are food, fun, and festivities galore, including a Hairy Man Contest... more"